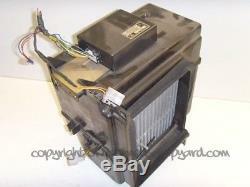 Mitsubishi Delica L400 2.8 94-96 air conditioning cooling unit MB946625 air con. From a Misubishi Delica / Space Gear / Starwagon L400 Mk4 in Green that we are breaking. We only sell Genuine parts in good condition and in good working order. These parts come from an immaculate car, with a full service history. They have not come from a write-off or end of life vehicle. If you can find a similar part cheaper anywhere else, let. We pride ourselves on the price and the Quality of Service. There are more photos of this part on. Please make sure that all parts are correct for your model and year of Vehicle. We are always happy to help; we are car enthusiasts first and foremost! Please check out our other Items! If you are not in when they attempt to deliver you will be left a calling card. Collection of the item or redelivery can be arranged by contacting your local depot or post office. This doesn't include NI, ROI, offshore, the highlands or international. They do not come from scrap cars or end of life vehicles. However we cannot cover any fitting charges that may be incurred and our prices reflect this. Whilst we take every care in packaging our items we will NOT be held responsible for goods damaged in transit if they have been signed for in good condition. We are a new, family run business that understands the value of excellent customer service. Based in Halifax, West Yorkshire, we will do all we can to ensure you get the OEM parts you want, at an unbeatable price. We are enthusiasts first and foremost! All parts are guaranteed for 28 days unless otherwise agreed in the listing. Our guarantee covers mechanical parts only. We do not cover any labour costs, or damage costs, for any faults arising from the fitting of a part we supplied. Electrical items are not guaranteed. The guarantee is void if any part has been tampered with in any way i. Seals broken, item taken apart, etc unless otherwise agreed. If any unauthorized alterations are found to have been made to a part then any return may be refused. All items are checked and tested before they are sent out. This guarantee does not affect your statutory rights. The term engine refers to the cylinder head & block and the components that make these up i. Any ancillaries left on the engine e. Water pump, cam belt, sump, pulleys or similar are supplied free of charge and are not covered by any guarantee (unless otherwise agreed in writing). Gaskets, sumps and oil seals are also not covered. We would suggest that all engines/gearboxes are fitted with new timing belts/chains etc, and that all engine oils & filters are replaced before running is commenced. The item "Mitsubishi Delica L400 2.8 94-96 air conditioning cooling unit MB946625 air con" is in sale since Friday, January 31, 2014. This item is in the category "Vehicle Parts & Accessories\Car Parts\Other Car Parts". The seller is "stevecoogan" and is located in Halifax. This item can be shipped worldwide.